IK Multimedia is proud to announce that iRig® Pro I/O, the cutting-edge high definition audio/MIDI interface for iPhone®, iPad® and Mac®, is now available in the Apple Store® at more than 200 locations worldwide and online. 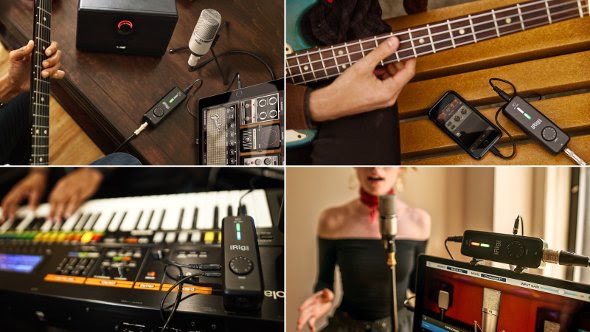 iRig Pro I/O lets musicians connect all their gear to their mobile devices or computers to make music and produce audio, anytime and everywhere, with a portable, pocket-size mobile studio they can always carry with them. The combo microphone and instrument input allows users to record high definition, studio quality audio anywhere. A MIDI input and output allow to connect keyboards and controllers and a headphone output jack with a dedicated volume control is perfect for use with the new iPhone 7 and its future generations. iRig Pro I/O is a truly powerful, professional and portable recording solution that operates on AA batteries when connected to an iOS device, or on USB power when used with a Mac. When used with an optional power supply unit, it even charges a connected iPhone or iPad during extended sessions. A huge selection of IK's award-winning apps and software is also included with iRig Pro I/O enabling complete music productions with a total value of more than $/€500. IK Multimedia is the leader of the mobile music creation revolution as the first company to utilize the power of the iPhone, tapping into it with products like the award-winning iRig line of guitar interfaces and AmpliTube amp modelling software allowing users to plug their guitars and basses into their phones and experience the most authentic amplifier tones and effects anywhere. iRig Pro I/O, together with the vast majority of IK Multimedia products are also "Made in Italy" in its fully owned state-of-the-art manufacturing facility that combines the highest quality processes together with a focus on unique Italian world class craftsmanship. This goes together with IK's social responsibility standards that ensure compliance with the strictest labour regulations in the world along with eco-friendly programs, such as lessening environmental impact by reducing waste, employing smart recycling techniques and reducing power consumption by utilizing roof mounted solar panels to generate electricity. iRig Pro I/O is available now from the Apple Store online and at more than 200 retail locations worldwide.